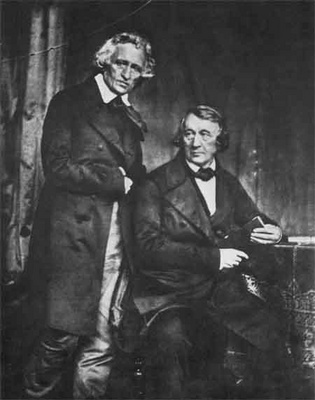 January 4th 1785; on this day, the older of the two Grimm brothers, Jacob, is born in Hanau, Germany. His brother Wilhelm is born the following year. As young men, the two brothers assisted some friends with research for an important collection of folk lyrics. One of the authors, impressed by the brothers' work, suggested they publish some of the oral folktales they'd collected. The collection appeared as Children's and Household Tales, later known as Grimm's Fairy Tales, in several volumes between 1812 and 1822. Tales in the Grimm brothers' collection include "Hansel and Gretel," "Snow White," "Little Red Riding Hood," "Sleeping Beauty," "Rapunzel," and "Rumpelstiltskin." The brothers developed the tales by listening to storytellers and attempting to reproduce their words and techniques as faithfully as possible. Their methods helped establish the scientific approach to the documentation of folklore. The collection became a worldwide classic. Jacob continued researching stories and language, and published an influential book of German grammar. He also did important work in language study and developed a principle, called Grimm's Law, regarding the relation of languages to each other. In 1829, Jacob and Wilhelm became librarians and professors at the University of Gottingen, and Jacob published another important work, German Mythologies, exploring the beliefs of pre-Christian Germans. In 1840, King Frederick William IV of Prussia invited the brothers to Berlin, where they became members of the Royal Academy of Science. They began work on an enormous dictionary, but Wilhelm died in 1859, before entries for the letter D were completed. Jacob followed four years later, having only gotten as far as F. Subsequent researchers finished the dictionary many years later.